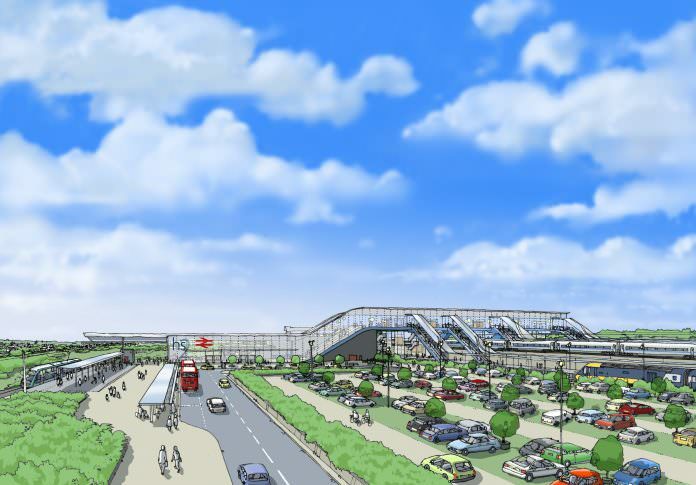 An artist's impression of what the Toton hub could look like. Credit: HS2. Architects from Weston Williamson + Partners (WWP) and engineers from Aecom have been awarded the contract to design and build the East Midlands hub station at Toton. WWP is already involved in the design of the HS2 stations at Old Oak Common in West London, Manchester Piccadilly and Manchester Airport and will now work on the Toton station, which will be on the branch linking Birmingham to Leeds. The hub, which sits in-between Derby and Nottingham, will be located at the Toton Yard rail freight yard and maintenance facility. There is a low-level, two-track railway that runs through the site and the proposed HS2 line will run on a viaduct at a high level, close to the existing lines. The station will comprise a two-storey building with overbridge concourse access to HS2 and national rail platforms. Tram services from the Toton tram stop will be connected to the hub too. To accommodate the 400-metre long HS2 trains, which will have the capacity for up to 1,100 passengers, the platforms will be 415 metres long. At peak times, it is estimated there will be six trains stopping per hour in each direction. WWP’s Rob Naybour will be hosting a RailExec Roundtable discussion on May 22.